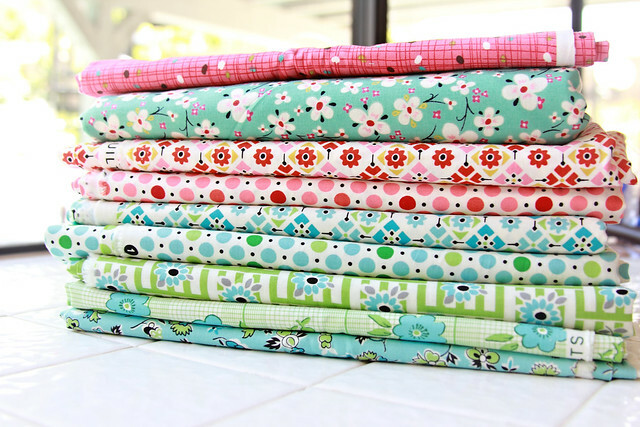 I know alot of you know already (especially if you are on flickr) but Denyse Schimdt has released a fabric line at JoAnn's and we have all gone gaga for it! It is sooo pretty. 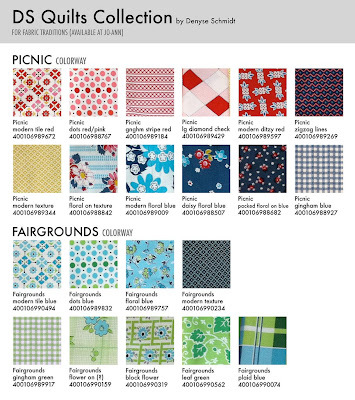 It does not have a name for the fabric line but it looks like the colorways are Picnic & Fairground and it is by DS Quilts Collection. I only bought 7 of the 21 prints. Here is the whole line. It is so great to have an amazing fabric designer design for JoAnn's since you can buy her fabric with a 50% off coupons!!! Which is unheard of in the quilting world. Most of us do not buy fabric at any place other than quilting stores since the designer fabric is sold there plus the quality of fabric is just so much better! I bought the prints that I like the most out of the line and I bought them with my 2 girls in mind. I am pretty sure they will both have lots of dresses out of them this summer so keep your eye out for them. After drooling over them yesterday (really I was) I have decided to use one of the prints for Penelope's curtains which I have been searching and searching for the right print to make her some and these are PERFECT! I just need to figure out which one I want to use ( I am torn between 3 of them) and go and buy lots more of it so I have enough for curtains. I just love when fabric gets you and makes you feel inspired. I know lots of us are going crazy over it and we should probably calm down since JoAnns will stock this line for a long time (that is what JoAnns is saying) but I think we all just fell in love and wanted to be inspired! I know I can't wait to sew with this fabric and get it up in my home and made into clothes for the girls to admire all the time. Happy Sewing to you! Everyone is blogging about this and I'm SO sad, I was just there and didn't see them. I'll have to trek out again this weekend. They look yummy and full of spring! 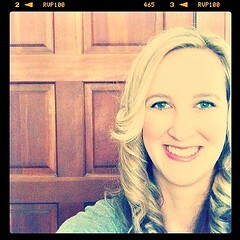 So, so pretty! I love the prints you chose. They will make the cutest clothes, can't wait to see what you make! It is beautiful! Does it seem like it is good quality fabric? This is the best picture I have seen of them online so far! Lovely prints..those cool blues and greens are perfect for summer! OH, oh, oh! I love this fabric. 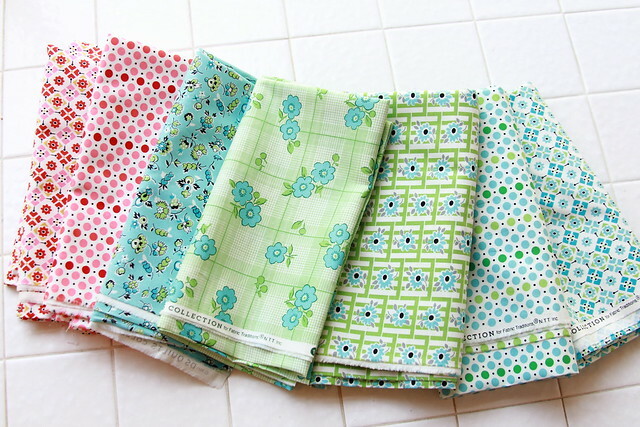 Sometimes I have quilter's guilt when I buy fabric from JoAnn's but some of their lines are gorgeous. This one is so wonderful :0) I look forward to seeing the curtains, clothes, and other miscellaneous creations. Happy Sewing to you also! I love your picks! I went to see what mine had today and they only had maybe 5 or 6 prints. I am hoping to see them get more in - I wanted to get a few different ones for summery dresses & skirts too! I came over from Amy Lou Who's blog and I just love that collection! I am gonna have to go track it down now! 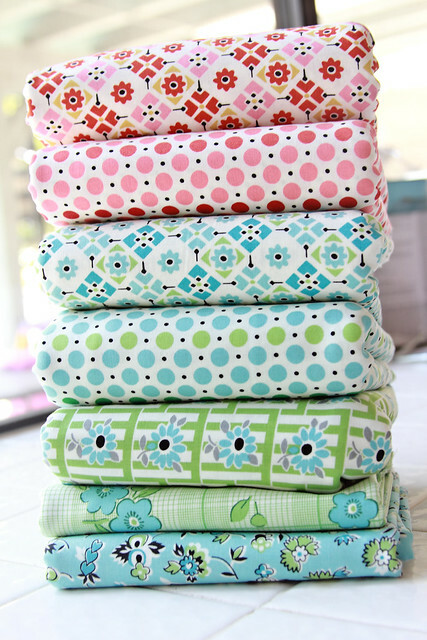 I must admit, I got caught up in all the hoopla about this fabric on so many blogs. I ran right back to JoAnns and purchased half yards of 12 different fabrics. They are indeed fresh and pretty. I look forward to sewing with each of them soon. I was on vacation and missed this. I'll be heading out to see if they have any this afternoon. The prints are great! I hope the quality is good, too!